WHAT'S UP THE PIKE: Retirees at Riderwood can't get enough Wii. Part ONE of a series on Hyattsville, the "Silver SprUng" of Prince George's County. 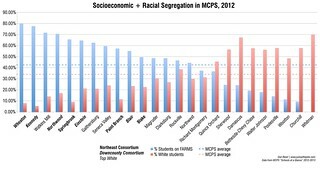 For more on Hyattsville, you'll definitely also want to check out the Silver Spring Scene's "Sister to the East" report. 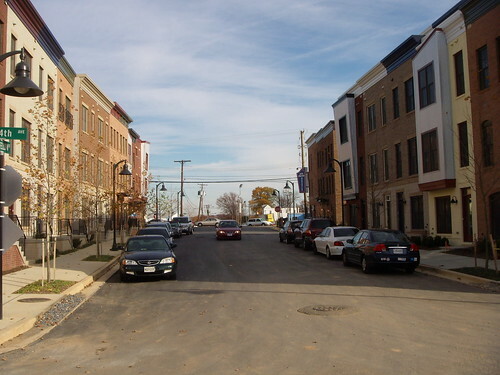 Longfellow Street in Arts District Hyattsville, a new development in northern Prince George's County. I'm standing in the bedroom of a model house that could easily pass for a recording studio or the green room of the 9:30 Club. An electric guitar rests against a desk cluttered with Rolling Stone clippings. Above it, a line of framed record covers march across the bright yellow walls. In the bathroom, there's a poster for the 1984 Talking Heads concert movie Stop Making Sense, and I wouldn't have been surprised if David Byrne's big suit was hanging in the closet. 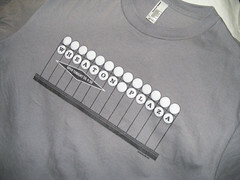 If you didn't get that reference, maybe the new homes at Arts District Hyattsville are too hip for you. And that's exactly how EYA, who's developing this new community on a former auto lot several miles east of Silver Spring, wants it to be. Unlike Silver Spring or Wheaton, Hyattsville doesn't have a nightlife or entertainment scene, even one that seems to shut down at 11 like on Ellsworth Drive. With 16,000 residents, it's the largest of a string of small towns lining Route 1 that grew up around the streetcar in the 1920's - and, before that, around a thriving port on the Anacostia River that silted up a century ago. Hyattsville last made news when it appeared on the now-defunct TV show Commander In Chief, which made it out to be a den of crime and seedy soul food joints. While ABC was forced to apologize for its inaccurate depiction - though its main drag is filled with defunct drive-ins - they did do Hyattsville a favor by giving it a patina of urban grit that would ideally attract moneyed hipsters there a few years later. 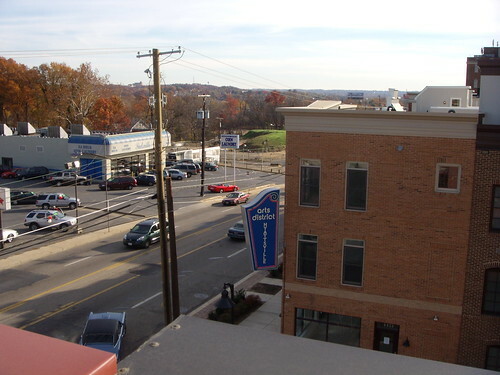 Sudsville, left, is an example of typical Hyattsville development along Route 1. That may change with the expanding Arts District project, at right. At completion, the Arts District will transform the old Lustine Chevrolet into a mixed-use neighborhood with a hundreds of half-million-dollar rowhouses and condominiums (called "the Lofts") and a spiffy strip of shops and restaurants, some of which will be in a handful of live-work units along Route 1. All buildings will be under four stories high, a conservative approach to a site in the town center - not unlike the townhouses EYA built at Cameron Hill in Silver Spring ten years ago, when even building next to the Metro was a risky financial investment. It doesn't do much to clean up Hyattsville's skyline, which exists mainly of a gloomy 60's-era high-rise (at its base, a sign reads "THE OGLETHORPE. A CONDOMINIUM") and a mysterious brick monolith owned by Verizon. While the development will eventually boast an outpost of the D.C. cafe Busboys and Poets, its name sounds gimmicky when compared to actual artist housing projects in the Gateway Arts District, established by Prince George's County and encompassing the towns of Hyattsville, Mount Rainier and Brentwood. Four years ago, the Post wrote about one such building, the Mount Rainier Artist Lofts, which houses "painters, print makers, photographers, musicians and dancers" in twelve rehabbed and subsidized apartments. There are also studios, a folk music institute, and a couple of galleries. 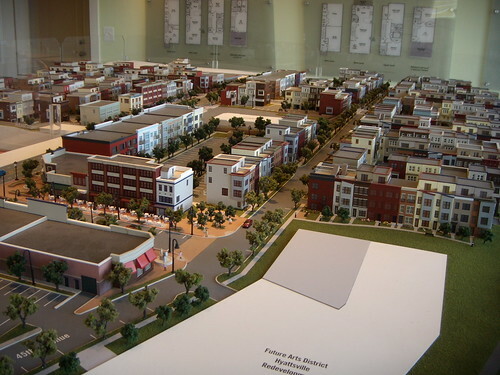 The Arts District Hyattsville model. At completion, the project will include roughly two hundred rowhouses and condominiums. When I visited Arts District Hyattsville over Thanksgiving weekend, conservative sedans and SUVs mingled with construction equipment on the newly paved streets. A young couple pushed an expensive stroller past a line of half-finished rowhouses with steel accents glinting in the midday sun. And in the sales office on Route 1, three smartly-dressed agents worked a steady flow of visitors that ranged from curious townies to the usual yuppie suspects. Alex, one of the sales agents, proudly shows me the sprawling model, complete with cars, people and little white bistro tables. A giant blank spot reading "EXISTING BUILDING" occupies the center of the community; at first glance, it looks like it could be a giant park or town square. "What's that?" I ask. "Sudsville," Alex responds, gesturing to the colorful sign of a giant laundromat across the street from us. "And it's not going anywhere." Sudsville may not be the kind of urbanity Arts District wants in its back yard - or front yard, for that matter. To see just what they're looking to sell you, we'll return to its model houses and see what posh digs a tortured artist can snag with a little success. I took a stroll down to this project as well. It was smaller than I imagined, hopefully with the other phases it will straddle both sides of route 1 going south for a good distance. Funny that the Lustine dealership is now a historic piece. I can't recall if this is the same one my parents bought the 87 Nissan Maxima from but I know it was a Lustine dealership. I love your blog. Great writing style. I drive through the Hyattsville Arts Dsitrict at least once a week to see the latest on what's happening down there. I have to say that I am so excited about this project! The fact artists are appreciated and encouraged to be a part of this community means so much to me. And to think that I don't even live or work in Hyattsville.....yet! I just can't wait to see what this place looks like when all the major development is completed. There are very few artists I know that could afford one of the town homes, and those who could would most likely not live in Hyattsville.